The American service industry is a gamut-running, ever-changing, hustle of a business. Appearing from the rubble of consumerism stand the barista and the budtender — two of the current job market’s brightest stars. Unlike some other customer service professions, these two careers are at the forefront of trending enthusiasm for artisanal coffee and legal cannabis. But how do barista and budtender jobs compare, really? Can you easily transfer from one industry to the other? As a former barista and current cannabis writer, there are some instant comparisons that come to mind when examining these two jobs side by side. Not only are they both direct customer service jobs, they also represent and facilitate major demand for speciality products that offer consumers energy, relaxation or comfort throughout their busy days. Since the barista and budtender are both high profile figures in the industry, they carry the burden of a fastidious consumer base that expects greatness in every cold brew and bud they buy. Success in the coffee and cannabis industry as a server requires in-depth product knowledge and an ability to proficiently discuss and recommend products. In today’s market, it’s not enough to just know how to steam milk. Third wave coffee seems to have officially strong-armed the bitter coffee of yesteryear into oblivion and looks poised to continue its progress into the 2020’s. In addition to knowing how to make a variety of espresso drinks, baristas must have a refined palate for coffee aromas and flavor profiles. Additionally, they must be familiar with roast variations, countries of origin, farming practices, partnerships and so much more. It seems like everyone who smokes cannabis deems themselves an expert, but in reality very few are as knowledgeable as they say. Budtenders are made up by the most passionate and informed stoners you’ll find throughout the country. Budtenders are well versed in strain differences, consumption methods, farming practices and everything else relevant to do with cannabis. Budtenders have a unique challenge as they must be fluent in seamlessly describing the recreational effects and medicinal benefits of each product. Another similarity between budtenders and baristas is the competitive nature of each position. Though both jobs are frequently referred to as entry level jobs, businesses are swamped with resumes throughout the year and must weed through a enormous pool of applicants when hiring. Given the uptick of college educated individuals finding themselves in service and entry level careers, the competition for the service sector’s most valued positions is especially fierce. After viewing a job posting for a budtender in Portland, OR on Indeed.com, I noticed the position had been applied to over one hundred times just three days after being posted. The job paid ten dollars an hour. This just goes to show how that some are willing to sacrifice a buck or two to help break into a more desirable industry. This same rule can be applied to the coffee industry. I remember how straightforward getting a job as a barista was when I first started — not that many people seemed to have latte art skills and coffee knowledge at the time. Today, there are incredible career baristas who have truly elevated coffee into an art form and social media sensation, thus increasing competition for jobs. The reality of service industry wages is a bleak one. Speaking from experience, being a barista never really provided an especially stable living. I’ve had some great work experiences, but the living is tough. Across the board, barista and budtender wages start anywhere from minimum wage to about twelve dollars per hour for an entry-level position. To be fair, tipping does partly make up for the low hourly wages for baristas, but budtender tip-outs are usually less meaty. While there is room in both jobs for advancement and promotion, raises rarely exceed twenty dollars per hour, even for supervisors and managers. While the compensation may not be anything special, the interesting nature of the job description keeps candidates at both industry’s fingertips. While there are striking congruences between the coffee and cannabis job market, the difference between products is of important significance. With each unique product carries a unique demographic of customers. Individuals who purchase a latte every morning may not buy a joint at night. The specificity of coffee and cannabis is largely what makes them so popular. Though you can approach customers with a similarly friendly, informative attitude for both jobs, you cannot sell the products as though they’re the same. Cannabis is ultimately still operating as a partly-legal substance due to federal regulations, even in states where it is technically legal. There are serious precedents budtenders must follow in order to ensure compliance with state and municipal regulations. Cannabis regulation is stringent and the government, litigious. Budtenders and other dispensary staff who fail to follow every law perfectly can be personally punished, or the business can be shut down entirely. For this reason, budtenders have to be on their toes as new legislation arrives. In most states, budtenders either have to have a medical marijuana card recommendation from a doctor, or a marijuana worker’s permit. Though baristas don’t have to be as concerned with developing legislation, they do have to be more cautious about hygiene, especially in cases where food is also being sold. In several states across the country, baristas have to have a food handler’s card that proves they’ve received preliminary food safety training. Another distinction that aptly highlights the differences between the coffee and cannabis industry are the regular hours of operation. Whereas I’ve opened cafes up at five am, most cannabis dispensaries I visit open around nine am at the earliest. For early birds, working at a coffee house may be an ideal avenue to free up your afternoons and evenings. On the other hand, folks who want to stay out a bit later at night and catch that extra bit of shut eye in the morning may prefer dispensary work. 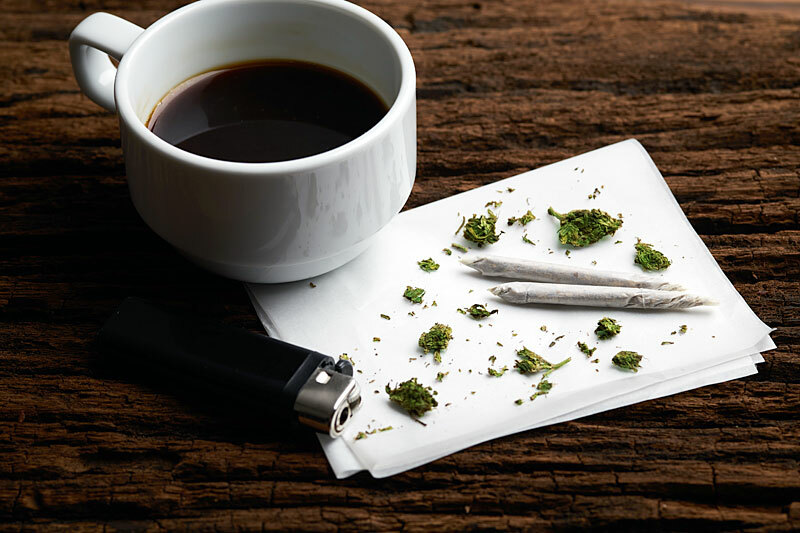 After considering how barista and budtender jobs epitomize two singular, confident industries while maintaining similarities, the question remains: are there opportunities for mobility between coffee and cannabis? What hiring managers look for in their employees is diverse and at times, unpredictable. With that said, there are some safe bets to display on your application that will increase your likelihood of getting an interview in the opposing industry. Strong customer service is the hallmark of a good barista and budtender. Both of the industries depend on direct customer interaction and efficient service. From my personal experience applying for budtender jobs, I spoke with owners who told me outright that they valued my barista experience more than my outright cannabis knowledge. This won’t necessarily be the case for every dispensary, but it proves how important the customer is in each setting. Working in a coffee house or dispensary requires a fair amount of standing and moving on your feet. Both jobs experience rushes and lulls at different points throughout a shift, which requires employees to think and act quickly. Employers are looking for candidates who have the energy and personality to consistently interact with customers and co-workers with limited breaks. Let’s get down to the brass tacks. The biggest thing holding you back from switching between barista and budtender jobs is the product itself. Naturally, dispensary owners desire candidates with experience working with marijuana, or at very least, an expertise in cannabis knowledge. If you feel underqualified in this area, consider using educational resources like THC University. Job training programs allow students to take online or in-person courses in budtending to give some credibility to their application. If you don’t have the money to spend on certification, do your best to self-educate! As someone who has primarily used this method, I can tell you that research can be your best friend. It’s a great way not only to introduce yourself to all things cannabis; it exposes you to a large network of cannabis enthusiasts and businesses. When it comes to changing careers from budtender to barista, the lack of professional coffee experience is perhaps just as much of an application hurdle. For this reason, barista training programs also exist that helps to provide applicants with a greater level of knowledge and aptitude. The customer service industry is a wild game. There are no guarantees that following all the “right steps” for finding a job will pan out, but it’s always worth a shot. One of the benefits and pitfalls of the industry is the high turnover rate. One the one hand, turnover creates inconsistencies in a business’ staff, but on the other, it allows for a more frequently updated job sector. The best advice I can give for each industry is to educate and be persistent. Especially for those of us with limited means, persistence is what ultimately helps us land our desired job. The American job market is constantly developing, leaving many job candidates’ questions unanswered. It therefore becomes beneficial for the candidate to take matters into their own hands and confidently lead their job search until coming back successful.